Some people dismiss the IB as ‘just more work!” However, the program offers plenty of opportunity to delve down into complex and challenging issues because students must cover higher as well as standard level options. Physical Education: this elective is a half year option. The IB offers four programmes for students aged 3 to 19 which help develop the intellectual, personal, emotional and social skills to live, learn and work in a rapidly globalizing world. There are more than 1,235,000 IB students at 3,946 schools in 147 countries. Only schools authorized by the International Baccalaureate Organization (IBO) are eligible to teach the curriculum. Gaining IB school status involves a rigorous two-year authorization process, but it’s designed to support schools and ensure that they fully understand the nature and requirements of the programme. Sometimes more teachers are needed, but in general schools find it challenging and rewarding. There’s a global quality control and inspection regime, involving self-inspection, on-site visits and submission of documentation to IBO headquarters. The program allows teachers to expand beyond the district mandated curriculum and state based standards. Interdisciplinary lessons and themed units, create an avenue for teachers to use their creativity and make lessons meaningful. Teachers build off of information and help the students make connections to real world issues. Lessons take our students around the world! In addition, culminating field trips are a wonderful way to help our students truly grasp the information shared in class! 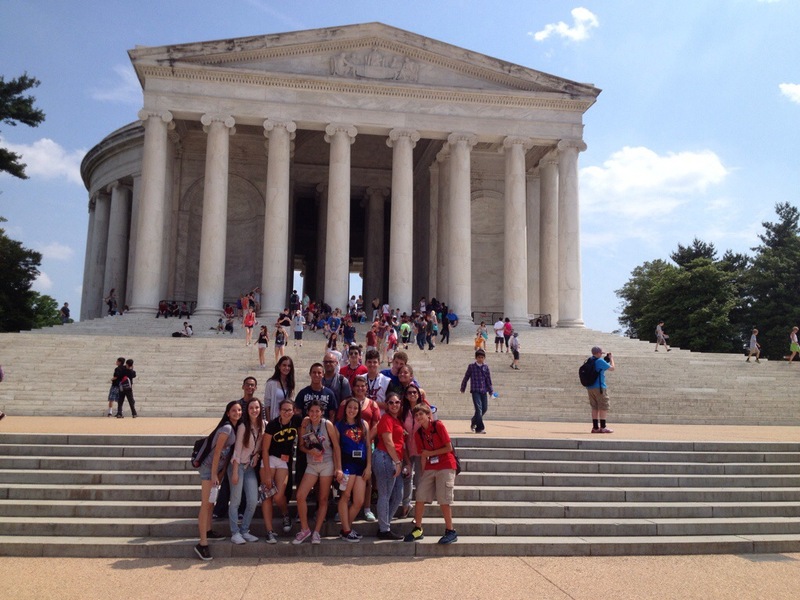 8th grade culminating field-trip to Washington, DC. Many of IB Middle Years Program students continue on the IB Path. Students from Lamar Louise Curry Middle School are able to participate in the Diploma Program . Our closest high school, Ferguson Sr. High, offers IB—but it is also offered in other schools such as, Coral Reef Sr. High and Coral Gables Sr. High! As participants of the Middle Years Program, our students leave with a solid foundation that helps them succeed within the Diploma Program (DP). IB DP students graduate with 2 diplomas—a high school diploma and an IB diploma which is internationally recognized and highly favored by universities. This program also offers students an array of scholarship opportunities. Curry Students usually leave to high school with 5-7 High School Level credits!!! The IBO’s goal is to educate the whole person and foster responsibility. The Community Service element of the IB requires that students share their energy and talents with others, beyond academic work. A minimum of 40 hours of participation over the three years in creative, physical and service activities is required. The idea is that you give something back to the community. For instance, IB students at Curry MS volunteer at various local charities (Miami Rescue Mission, Relay for Life, Luv My Fur Babies, Dolphins Special Teams, etc) , Daycares and Elementary schools, Assisted Living Facilities, the Miami Children’s Museum, and the Miami Dade Parks Services. The feeling of doing something good motivates our students to go far beyond the 40 hours of community service. Progress is monitored through self-evaluations and the IB Coordinator. Whether it’s joining a Curry Sport or Club, we understand the power of being balanced and having time management! There are so many choices at Curry! From book club to drama…soccer to bowling; our participants are winners! District champs in track and field, soccer, volleyball, bowling, rob otics, and chess—just to name a few! Curry students taking IB courses acquire leadership skills while simultaneously participating in various academic and social activities; as well as, through the peer mentoring program that is student coordinated. It’s wonderful to see the students in action. The IB at Curry has a student government body—with council members which include Student Ambassadors. The Approaches to Learning (ATL) is a core concepts of the IB, challenging pupils to think critically and become a lifelong learner. Through approaches to learning, students are provided with the tools to enable them to take responsibility for their own learning. Central to this is “learning how to learn” and developing in individuals an awareness of how they learn best, of thought processes and of learning strategies. subject-specific and interdisciplinary conceptual understanding.